You're receiving dozens of similar referrals from teachers and your principal wants to know your plan for small groups. Meanwhile everything you learned in grad school is not coming in handy. Sound familiar? Welcome to back to school season, new counselor! How do I find students for my group? Planning small groups (even last minute) can be simple with a little organization and preparation. First sort your referrals by topic (self-control, self-esteem, conflict resolution, anger management, etc.) You are likely receiving referrals from teachers and possibly parents or the students themselves! Check out the referral form I use here. While you don't want to "recruit" students for counseling, everyone agrees that a preventative approach is better than a reactive one. Setting up a table at Back to School Night or Open House is a good way to inform parents of your available services. You can also send an email to teachers mentioning students who received counseling the previous year and ask them to let you know if they have similar concerns this school year. Small groups work best when they are actually small. Who knew!? I have had groups as large as 10 but prefer to keep around 5 or 6 and when they are little ones maybe even groups of 3. Keep in mind your behavior management skills when selecting group sizes. How do I schedule my groups? Once you have your groups organized, send out permission slips to parents and coordinate available times with teachers. Download this editable permission slip for free! You also want to clarify if you will be picking the student up or calling them to your office. Check out this video for a call log and some other organization tips! How long should my group be? Small group counseling sessions should be around 30 minutes. Depending on your school's schedule you may even have less time. These are often scheduled during lunchtime and the students can bring their lunch and have a "lunch bunch." Keep this in mind as you plan activities. You don't want to plan crafts or a big art project if the kids will be eating. Also, I have found that 6-8 week long groups seem to be the most effective. This gives the students plenty of time to learn and practice a new skill without becoming dependent on the weekly sessions. How do I plan my group? Now the fun planning part begins! You may have a curriculum that your district provided you with and you have somewhere to start. In my experience these things were rarely provided so I either bought books and resources with my own money or created some free activities and lessons. You probably have lots of ideas you found from Pinterest over the summer! These 5 components are a helpful structure to get you started when planning groups. Start the session with a feelings check where everyone goes around the table and shares how they are feeling and why. You can pass around an item to help facilitate it or use a visual aid for younger students. These emoji cards are a fun way for little ones to identify their feelings. You may have to model this a few times at first. Grab this feelings check freebie here. The icebreaker is intended to make students feel comfortable. It is best executed when it is paired with the upcoming lesson topic. For example during a self-control group having the students play Simon Says or Freeze Dance is a fun way to introduce the topic while they think they are simply playing a game. You can later explain the connection. Introduce a new concept or review an existing one if this is a later session. A great way to keep kids engaged when learning a new topic is with videos. Check out my school counseling video resource guide here. The main activity is where the students play a game, use discussion cards, role play, complete worksheets, etc. to practice using the skill they are learning. This is the core of the session and should take up the majority of the time. Have students close the session by writing a few thoughts and reflections about what they have learned that day or how they plan on applying it to their everyday lives. This part can be challenging so include writing prompts. For younger students, a verbal check out may be a better option. Have students complete self-assessments during the first and last session to track progress and collect data. Check out the self-assessments I use here. *Don’t forget: You need to come up with a way to keep track of everyone. I have students sign in upon arrival to keep track of attendance. Feeling overwhelmed? 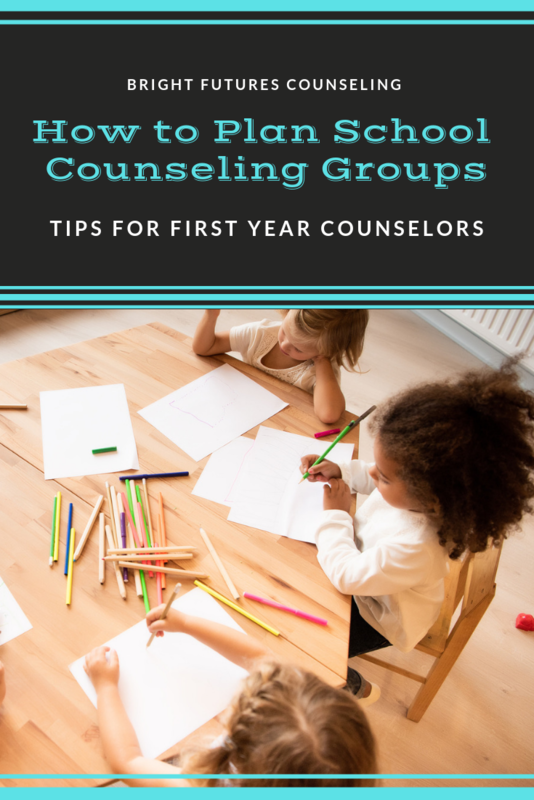 These books are great resources to start planning for groups or you can check out my pre-made school counseling group curriculum here. Good luck, you've got this!